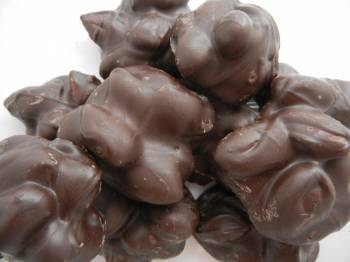 Clusters of premium almonds covered in rich dark chocolate. A delicious treat with benefits! Almonds are packed with nutrients and fiber, and dark chocolate is full of antioxidants and flavanols. Go on...enjoy some without feeling guilty. Mix some in to trail mix, add to cookie recipes, or use as a topping on your favorite dessert.